SubhanAllah! Today we claim to love RasoolAllah (Sallallahu Alaihi Wasallam) more than any one else, But when we find the need to express our happiness, All we end up doing is to write this Absurdity in the likes of LOL (Laugh Out Loudly), which explicitly goes against the established Sunnah of Rasool Allah (Sallallahu Alaihi Wasallam). 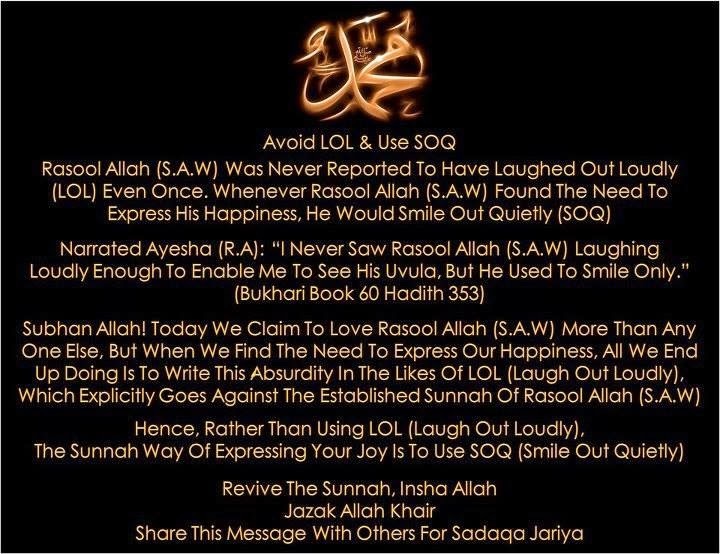 ◈➲ Hence, Rather than using LOL (Laugh Out Loudly), The Sunnah way of expressing your joy is to use SOQ (Smile Out Quietly). ◈➲ Revive the Sunnah, InshaAllah Jazak Allah Khair.